There are many reasons people suffer with acute sleep difficulties which can be intense but short-term. Life stressors including death, divorce, illness, financial worries, job loss, and/or concern for or disagreements with family and friends can all cause an interference in how we sleep. Sleep challenges caused by any of the above situations tend to dissipate once the underlying cause for concern is resolved. For the sake of this article, I’m referring to people who are doing relatively well in life. They’re gainfully employed, have a roof over their heads, their loved ones are safe and life is good. Still, their sleep struggles persist long-term and can even become chronic. Whether it’s hard to initially fall asleep or challenging to fall back to sleep in the middle of the night, both situations are frustrating and a great cause for concern. If you identify as one who has chronic sleep challenges and you’ve tried everything you can think of to get a good night’s sleep but still suffer, let me suggest that you start following the twenty-four hour rhythm of the sun. What I’m proposing is that you allow your master clock to connect with the sun’s circadian rhythm. In fact, the most pressing point of this article is: Your body rhythm is meant to be in sync with the sun! Follow this and you will be well on the road to excellent sleep and optimal well-being! Your master clock, the suprachiasmatic nucleus (SCN) is located in your brain. When light enters your eyes, it tells the brain that it’s daytime. The amount of light lets your brain know which hormones to release or not. For example, less light at nighttime signals your brain to make melatonin, the sleep hormone. More light instead tells your brain that it’s daytime and to hold off on producing melatonin. Below is a chart of the circadian rhythm cycle that tells your body when to sleep, rise and eat. It’s impacted by sunlight, darkness and temperature. What Causes a Rhythm Disorder? The explanation for this is super simple. Artificial light. The light bulb and the bombardment of personal electronic devices – cell phones, reading tablets, notepads, televisions, digital alarm clocks, etc. – all give off light that shine directly into your eyes well into the evenings and frequently until the moment you ‘turn out the lights’. The result? Your brain is thrown completely off and thinks it’s daytime when in fact it’s night. This is the not so super simple part. You need to make a conscious, concerted and consistent effort, beginning right after dinner, to reduce your exposure to any and all types of light emissions. This task is seemingly simple, but it’s not really. After all, if it’s your habit to watch television and unwind after a long day, how easy would that be to discontinue? For others, evening offers a chance to catch up on social media news, correspondence and so forth. 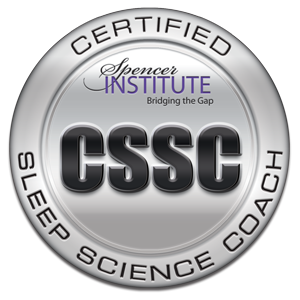 In my Sleep Science Program, Back-To-Sleep, I offer my clients many proven techniques to support them to regain their natural sleep rhythm. To review everything here is simply not possible. However, I’m happy to share the following three tweaks which are certain to help you get started on the natural path to your healthy sleep rhythm. Also, if you enjoyed this article, please share it with your friends, family members and colleagues. Together we can make a loving and huge difference in healing ourselves and others. Susan D’Addario is a Certified Sleep Science Coach and Founder of Back-To-Sleep. She helps people struggling to get a good night’s sleep, and aren’t able to be their best at work or at home, to finally be able to sleep soundly again so they feel rested and ready to take on the world.